True stories of triumph don’t come any more Hollywood-ready than the 2010 rescue of 33 Chilean miners, who were trapped 2300 feet below the earth for 69 days after the copper-and-gold mine they were working in collapsed. Thankfully, the inevitable movie of their harrowing ordeal doesn’t disappoint. Under the sure-footed direction of Patricia Riggen, the film manages to build intensity and suspense throughout, even though its outcome is already well-known. The 33 begins with a startling statistic: More than 12,000 people die in mining accidents every year. That sobering reminder is then followed by stunning aerial shots of Chile’s gorgeous Atacama Desert, where the 121-year-old San José mine is located. Nearby, a retirement party is in full swing for a veteran miner who only has a few more shifts left before calling it a career. It’s here that we are introduced to most of the film’s major characters: Mario Sepulveda (Antonio Banderas), a stalwart worker and fun-loving husband and father; Álex Vega (Mario Casas), a nervous dad-to-be who begs for an extra shift to help pay the bills; Luis Urzua (Lou Diamond Phillips), a mine supervisor known affectionately as “Don Lucho”; Edison Peña (Jacob Vargas), an energetic Elvis impersonator; and Yonni Barrios (Oscar Nuñez), a philandering husband involved with a feisty mistress. Two other notable workers are Darío Segovia (Juan Pablo Raba), an alcoholic estranged from his sister Maria (Juliette Binoche); and Carlos Mamani (Tenoch Huerta), a young Bolivian who is treated as an outcast by most of his Chilean co-workers. The other miners, regrettably but understandably, are never given a chance in the spotlight due to the time constraints of a feature film. On the morning of August 5, 2010, the miners are dutifully going about their work when a colossal collapse occurs. Boulders bounce around the mine and rush through shafts, threatening everything in their path. The 33 miners quickly retreat via two underground trucks to “the refuge,” a schoolroom-like part of the cave that is supposedly equipped with food, medical supplies, and an intercom to the outside. What the men find, however, is a trunk with only a few cans of tuna, some cookies, and condensed milk; an almost bare medical cabinet; and a broken intercom. Even worse, they soon discover that the escape ladders up the “chimneys” were never completed. They’re stuck more than 200 stories below ground in near 100-degree heat, with a 700,000-pound boulder twice the size and weight of the Empire State Building blocking their way. Above ground, things aren’t going any better for the men. The mine’s profit-conscious owner has no intention of mounting a rescue effort, and the government’s delayed drilling attempts fail. As the miners carefully ration their supplies and try to keep their wits about them, their families gather outside the mine, set up a tent city, and demand answers. Of course, days turn into weeks of agonized waiting, until finally on day 69 the men are saved by an international rescue effort. Riggen and her trio of screenwriters (Mikko Alanne, Craig Borten, and Michael Thomas) do an excellent job of compacting 69 days into two hours of screentime. And while the story plays out in broad strokes, every moment still manages to feel lived-in and essential — except for a bizarre fantasy sequence in which the miners imagine their wives, moms, and lovers feeding them, which is so jolting and out of place that it should have been left on the cutting-room floor. It’s also disappointing that the movie is in English rather than Spanish, and that some key roles are played by non-Latin American actors, especially Maria (Binoche is French) and a Chilean chief engineer played by Irishman Gabriel Byrne. The movie was shot in two working Colombian mines, and cinematographer Checco Varese uses the dark, cramped spaces to great effect, using minimal light to create a thick, claustrophobic atmosphere that is completely unnerving. Banderas, whose “Super Mario” becomes the group’s de facto leader, gives a compelling, commanding performance. And while Mario might be the film’s anchor, Phillips’ Don Lucho is its soul. Lucho continually alerted his bosses of the mine’s hazards, but his concerns went unheeded. He, more than anyone, feels the weight of the tragedy, and Phillips’ quiet yet potent performance makes us feel it too. 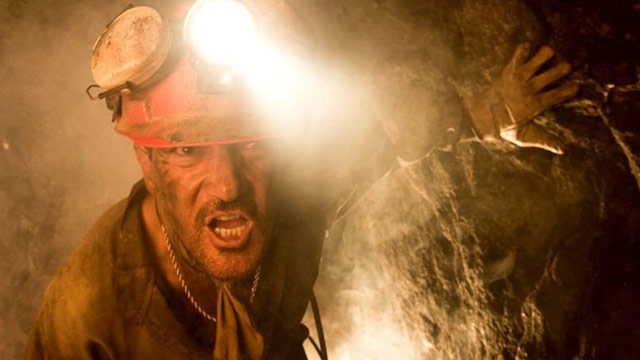 The 33 is a made-for-Hollywood true story that is uplifting, entertaining, and unforgettable; it’s a rousing crowd-pleaser that will leave audiences cheering.